Looking for an impressive pair of unique flamingo statuary? Look no further! 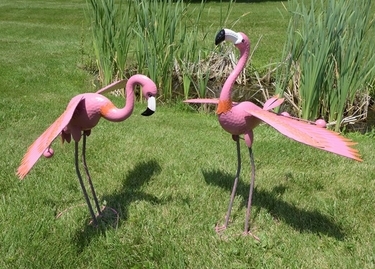 Our newest metal Pink Flamingos with moving wings make a great find! Get ready to become completely hypnotized in fascination with these amazing metal bird sculptures. Bursting with bright pink delight and counter-balanced wings that move gracefully in the breeze, these lively Pink Flamingo deliver enormous personality and fun! At nearly 3 feet tall, this pair of metal flamingo birds bring tons of color and movement into any outdoor garden or home setting with wings that flap in the wind. Great fun for lawns, entrance greetings, large yards, around pools, and front lawns.